The Turrialba volcano eruptions in Costa Rica are a sight to behold. Travelers come from all around the world to see this magnificent wonder of nature, and Ticos (local Costa Ricans) hold a sense of awe, wonder, and beauty that this volcano brings to their daily lives. Come to see for yourself why this natural phenomenon is catching so much attention. Where is Turrialba volcano located in Costa Rica? – The Turrialba volcano is located in the beautiful town of Turrialba, where our office is located! It’s in central Costa Rica, in the province of Cartago. How far is Turrialba volcano from San Jose? – The Turrialba volcano is located 44 miles from San Jose. What is the Turrialba volcano’s recent activity? – The volcano has been emitting volcanic ash with small occasional eruptions since 2014. The latest activity is the emittance of volcanic ash in September 2016. Today’s media can be interpreted in many different ways. Being able to distinguish fact from fiction or hype is a key component to being properly informed on all of today’s travel topics, subjects, issues, updates, alerts, warnings, emergencies, etc. Calling a story one thing versus another is the first step in this understanding. Today’s media fully understand what “sells” in the news: topics, issues & advisories are not nearly as attractive as alerts, warnings or emergencies. Take time to inform yourself by reading various sources and understand that slowing down and educating yourself is the first step in being rational and making well-informed decisions on your travel plans. While we don’t want to discount all news’ stories as being blown out of proportion, we strongly suggest getting various opinions and perspectives before making rash decisions, which could affect your hard-earned travel plans. We have worked through various travel planning adjustments with our clients due to the volcano’s eruptions, and while we can not predict if, when and/or how the volcano will erupt, we can speak from past experience and can inform you of the best ways to prepare yourself for your trip to Costa Rica as the Turrialba Volcano & Mother Nature take their courses. While an erupting volcano is a very big deal and potentially quite dangerous, this particular volcano has been relatively harmless. If, as a visitor from North America, you visit Costa Rica and talk to the Ticos about their perspective of the volcano, you will probably be surprised as to their reaction. It is not one of fear or impending Armageddon–doom; quite the contrary in fact. When asked about the subject, their faces light up with the standard Tico smile and they first brought to attention the awe, wonder, and beauty that this volcano brings the incredible natural environment and biodiversity of their home country. When asked if they are scared, most Ticos shrug their shoulders and hold up their arms as if to say – “I have no control over that, so why worry?” This can have a rather calming effect for a foreigner visiting this new and beautiful country. In the past, Volcan Turrialba has done nothing more than spew ash into the sky, which has caused for some extra cleanup in San Jose and the Central Valley. At various times it has temporarily closed the SJO airport and required residents of various towns in the Central Valley & San Jose to wear masks to avoid inhaling the ash. In our opinion the erupting Turrialba Volcano is no reason to cancel your family vacation, honeymoon, or adventure travel plans for your upcoming trip to Costa Rica (that you deserve). Trying to predict when a volcano will explode is like playing the lottery, so there is no sense in it. The worst thing that we have seen working here (as a result of the volcano) is the temporary closure of the SJO airport. While an airport closure can be inconvenient, so can engine problems on the tarmac, weather issues and a delayed flight crew, which delays way more flights than a volcano erupting. What does make sense is to take proper measures in preparing for your trip to Costa Rica by protecting yourself and your vacation investment. Here are a few quick things that you can do to best prepare yourself for a natural phenomenon as they relate to possible travel delays. Purchase travel insurance for your trip AND your flight – this is a good idea no matter what happens and there are many great providers that have worthwhile policies. 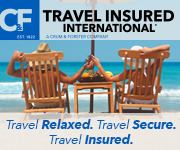 We recommend C&F Travel Insurance. Take time to read, review and educate yourself about the different coverage and policies that are out there. Make sure to speak with an agent if you have any questions so that you understand the full extent of your coverage and how to use it, if necessary. The biggest inconvenience that one will most likely experience due to a volcano’s activity is the closing of the Juan Santamaria airport in Alajulea/San Jose, Costa Rica. This type of delay can do any one of various things to delay your trip. If you happen to catch the volcano in the act, you will most likely be rerouted to another airport in Costa Rica or Central America, where you might have to reschedule ground transportation to get you where you need to be, wait a few hours in said airport or possibly even stay the night until you can be put on another flight. More often than not, if you are dealing with a canceled flight due to the volcano, on either end of your trip, you will have to reschedule your flight with the airline and will lose or even add some vacation time. It is typically worse to the actual travel schedule if this happens upon arrival. If this is the case, we will help you rearrange your travel schedule and itinerary for your first and possibly your second and even third days. Typically, travel insurance covers these changes in travel interruption. Your Costa Rica travel partner should always be there to assist you in rearranging elements to make sure that you get the very best out of your trip and that the proper documentation is acquired so that the claim can be made and funds recovered for this inconveniences. It is always a good idea to ask your travel partner about their experience in this and if they have preferred agents they work with, so they are prepared to assist you if this were to happen. This is the main reason why we suggest covering not only your trip’s inclusions but your flight as well. In the cases of a delayed departure flight, you can stay the night in a close-by hotel and wait until the airport reopens and reschedules you. You will have some added expenses for your time in this country, but you don’t lose anything aside from perhaps a day of work. It is always a good idea to keep up on the news before you leave. Reconfirming flights and asking questions about “plan B” is never a bad idea. This is your right as a client or customer of the airline. In the rare case that this happens to you while you travel this preparation will enable you to remain calm (because others around you will not) and develop a plan of action that much quicker in order to get your travels back on track. Keep in contact with your travel provider and make sure that you can count on them as a consistent resource throughout the process. Ask them questions and make sure that you are comfortable with their answers. Stay up to date on travel advisories and gather various perspectives. Contact us to help arrange a trip to Costa Rica that you will never forget! People travel all over the world to see active volcanoes. If you see an actual volcano’s eruption in person, consider yourself lucky and don’t forget to take lots of pictures. An educated traveler is a happy traveler!